A history of the terrors and the torments, the dirt, diseases and deaths suffered by our ancestors. 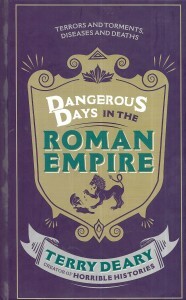 DANGEROUS DAYS IN THE ROMAN EMPIRE is the first in a new adult series by Terry Deary, the author of the hugely bestselling Horrible Histories, popular among children for their disgusting details, gory information and sharp wit, and among adults for engaging children (and themselves) with history. Richembergh, Goran Beus: Nijemci, Austrijanci i Hrvati I.